"Color is to the eye as music to the ear," said Louis C. Tiffany, America�s foremost stained glass designer. He did more to awaken America�s love of stained glass than any other artist of the 20th century. Louis Comfort Tiffany was considered the leading arbiter of taste in the Gilded Age, especially among the rich and social elite in America. His influence wasn�t restricted to glassware, but spread to interior decoration. He was fortunate to have been living in the age of the light bulb, developed by fellow American, Thomas Edison, in 1878, and of the filament lamp which followed in 1879. For it was the marriage of the electric light with his colorful leaded lampshades that sealed Tiffany's success. Born on February 28, 1848, he was the son of the wealthy Charles Tiffany, founder of Tiffany & Co. Jewelers, New York. As he grew older, Louis Tiffany became determined not to follow in his father's footsteps as a jeweler, and instead chose his own path. After leaving school in 1866 at the age of eighteen, he began his art studies informally. He became interested in glass after studying under the great American painter George Inness. While traveling abroad, he became overwhelmed by the beauty of the stained glass windows and ceilings in France. He soon discovered that stained glass had become a neglected art in Northern Europe since the Renaissance. He realized that this branch of art might offer new fields of challenge in the United States. It would give him a chance to explore his talent as a colorist. For Tiffany, color was the most important part of art and the most essential element in the field of stained glass. As a young man, Tiffany studied art in Paris. While in France, he met Emile Galle who was producing art glass in Nancy. Tiffany was, to an extent, influenced by him, and by the whole awakening Art Nouveau movement. At that time, however, he wasn�t thinking exclusively of glass but was also fascinated with Japanese prints, Middle Eastern art, and ancient Roman pottery. Upon returning to America, Tiffany continued painting in oils, but he enlarged his artistic activity to the whole field of decorative arts. He could have lived on the $35 million he inherited from his father, but he wanted to make his own mark in the world. So he founded Louis C. Tiffany & Associated Artists in 1875, and soon employed over one hundred skilled craftsmen. His interior designs were in great demand, and after restyling a suite of rooms in the White House in 1883, he became the most fashionable decorator in New York City. Tiffany Studios was an independent company formed in the 1890s. Prior to this, Tiffany had been working as a painter and interior decorator for about two decades under such names as L. C. Tiffany & Associated Artists, and Tiffany Glass & Decorating Company. Tiffany's work in art and decorative arts had led him to design windows and household decorations for special projects, the manufacture of which was usually contracted out. In the early 1890s, Tiffany decided to concentrate on the large scale production of stained glass windows, blown glass, lamps, and decorative household items for retail sale. Stained glass windows were almost always custom designed for a specific client, and while many of his other decorative items were stock pieces, some were made as special design orders. Tiffany's business began to fade just prior to World War I, and in 1917 Tiffany retired while allowing some of his employees to continue to sell wares as Tiffany Furnaces, though pieces were often made with parts long in stock that had already been marked Tiffany Studios or L. C. Tiffany. Tiffany died in 1932, his business bankrupt and liquidated. He began producing lamps after Thomas Edison suggested the idea during their collaboration on the electric lighting of the first movie theater, the Lyceum. But it�s also believed that he began making lamps as a way to use up scraps from his window manufacturing business. Embracing the Art Nouveau style at the beginning of the 20th century, he instructed his craftsmen to create elaborate lamps to fit the new style. His lamps quickly became popular at home and abroad. Craftsmen set tiny pieces of glass in natural patterns, featuring flowers, butterflies, or dragonflies, while the bronze bases complemented the leaded shades. Later, some shades were made in folds from panels of pressed glass, creating the appearance of a tweedy fabric. Some of the original Tiffany's were gas, later converted into electric lighting. An original Tiffany lamp is one that was created and designed by Tiffany Studios. As a historical fact, Tiffany never actually made any of the lamps himself, but just oversaw their production and design. The Tiffany lamps that came from his studio between 1899-1920 were personally guided by him through all stages of their creation. This not only included the shades, but the handmade bronze bases as well. Tiffany set himself the goal of putting a Tiffany in every household in America, whether it be his windows, blown glass or his new fashionable table lamps. The magnificent lamps of Tiffany studios were an instant commercial success, winning prizes and awards wherever they were displayed. He constructed his table lamps in two sections: the base and stem, and the shade. Shades consisted of many pieces of Favrile glass set in a bronze framework of irregular shapes, with the decoration often inspired by organic and naturalistic motifs. Dragonflies were common, as were Renaissance, zodiacal, bamboo and medieval motifs. Bases, constructed of bronze or gilt bronze, often incorporated tile or mosaic work. The shade sometimes reflected the design--the irregular border of lamps like the Apple Blossom and Wisteria enhanced the organic effect of the tree-like base and floral motifs. Being hand-made, no two shades were identical. Tiffany also developed and used innovative glassmaking methods. He avoided surface decoration, preferring to make ornament integral to the body of the piece. However, he was a designer of glassware rather than a glassmaker and paid little heed to the technical requirements of working in glass. The craftsmen employed at the factory to produce his designs frequently found them technically impossible. At first, Tiffany used glass bought from outside firms, but this did not give him total satisfaction. The Kokomo Opalescent Glass Company of Kokomo, Indiana, was one of his suppliers. Non-colored glass, such as common household window pane, has a natural tint of green. . This is caused by a small amount of iron oxide present in sand, a key ingredient of glass. During the Middle Ages, the Venetians actually developed "decolorizing agents," which neutralized the iron oxides and removed the green tinge. The result was crystal clear glass, without the pop-bottle looking green tinge, perfect for use in making art glass of all kinds. In the case of Kokomo glass, they used many combinations of coloring agents along with other elements, thus creating specific colors in the glass. As his fascination with glass grew, Tiffany experimented with lustering techniques, largely inspired by the natural iridescence of ancient Roman glass. He patented his first glass-lustering technique in 1881.And through much of the 1880's and 1890's, Tiffany experimented with glass, developing techniques that are still used by the stained glass craft today, such as the popular "copper-foil" method used in manufacturing his famous lamps. "Favrile" glass, the type most used in his lamps, resulted from these experiments. Arthur Nash, the head of Tiffany�s glass team, suggested the word "Favrile," a modification of the Old English word "fabrile," meaning "handmade," as a trademark, registered in 1894, for all Tiffany products. Favrile was simply a combination of common white glass, call opalescent, used by the early cosmetics industry to bottle its creams and ointments, and clear colored glass, called antique, used in stained glass windows for centuries. Artists, who tried to combine these two glasses before Tiffany, only produced a dull fragmented material that inhibited the flow of light. But Tiffany arrived at Favrile through extensive studies in chemistry and experimentation. The earliest lamp fixtures weren�t electrified as electricity wasn�t widely available and incandescent bulbs had not been perfected. Bases for the lamps, produced elsewhere until the end of the century, were cumbersome to accommodate a canister for kerosene or gas. Electrified models were introduced in 1900, but many of these offered a choice of fueling systems during the transition. Tiffany added a foundry and metal workshop to his operation in 1898 and created an array of bronze lamp bases that complemented and enhanced the designs of corresponding shades. One of his price lists from 1906 lists more than 300 models for shades and interchangeable bases. While his Favrile shades were free-form and hand-blown, his first leaded shades were geometric in design. Often, Tiffany craftsmen made these shades in diochric glass which appeared green in reflected light but orange in transmitted light. He shifted to organic motifs in 1900, when Tiffany introduced the earliest model of the popular Dragonfly shade at the Paris Exposition. Large blue-bodied dragonflies with overlapping purple-striated-blue wings were imposed on a blue-green background mottled with yellow to suggest rippling water. The wings, themselves, were covered with a metal filigree to simulate the dragonfly�s veins, and its red eyes, which touched the shade�s lower edge, or apron, were made of glistening glass jewels. Clara Driscoll, who in 1904 earned a $10,000 annual salary, designed many of these shades. 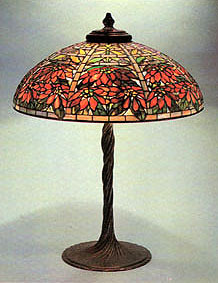 Another category of Tiffany lamp was the domed shade, also known as the flowered cone. Many featured profuse floral patterns of flowers in mottled colored glass with stems made of granular glass. He also made flowered globes and shades with irregular lower borders. Tiffany�s Wisteria lamps fell into the irregular upper and lower borders category. The multicolored Wisteria shades were remarkable not only for their superb naturalistic integration of vines and blossoms but as a complex technical achievement as well. The traditional straight edge of the opening at the top of the shade was replaced by an openwork crown cast in bronze which simulated the twisted branches of the vine. Wisteria clusters terminated in an irregular lower border of unopened blossoms. Each Wisteria lamp consisted of over a 1,000 pieces of glass. A typical model sold for $400 in 1906. Except for special commissions, most Tiffany lamps were made in his Corona workshops. Once he approved the design, an artist prepared full-scale drawings. Colorists prepared a chromatic scheme and craftsmen selected and cut the glass, using a template to guide them. Then they glued thin strips of copper foil around the edges of the cut pieces, which they placed over the pattern outlined on a wooden mold. They carefully applied lead and copper electroplating around the glass pieces, making sure that they rounded the lines in an organic rather than a flat manner. The subject of Tiffany's marks is complex and filled with misconceptions, elusive to even the seemingly well-informed. Tiffany's marks and marking systems changed over the years. Some are clear, but others are obscure. Pieces aren�t always signed or retain their original identification. Some have had unauthentic markings added. Original Tiffany lamps bear the company�s name and perhaps a reference number. Some have original paper labels. Shades were also marked with a bronze pad. "A specific Tiffany signature can usually be found pressed into the metal rim of the lamp�s shade," said Kim Hewitt, restoration expert with the Queens Museum of Art, in Corona Park, Queens, New York. "He sometimes signed his lamps �Tiffany and Co.,� cut from 1900 to 1910, he usually signed them Tiffany Studios." According to Alastair Duncan, Tiffany lamp expert and author of a book about him, the most popular models include the Wisteria, a perennial favorite, as well as the Peony, another hugely popular model that was in production from 1904 to the late 1920s. "The Magnolia was considered the pre-eminent Tiffany lamp some 20-odd years ago," she said. "It�s a very large floor model. Then we moved to the spiders and the cobweb lamps with mosaic bases. At the moment, the Lotus has become the most popular, but there are only three known--two of them are in private collections and one in a museum." Tiffany retired in 1918, but he kept a watchful eye on the company. Nash carried on the business, but his later work, fighting a rearguard action against Art Deco, wasn�t of the same quality. In 1928, L.C. Tiffany severed all connection with the firm, withdrawing permission to use his name. By his vision and energy, Louis.C. Tiffany succeeded in blending classical motifs with bold new techniques in glassmaking to create a distinctive American art form. The demand for Tiffany lamps among today's collectors attests to the lasting value of his work.